Police want more power to save lives and fight crime, they do what they want, when they want, they get caught crossing the line, they loose a rank, a weeks pay, while waiting for the outcome, they are suspended with pay. These two will get off with a years paid vacation! 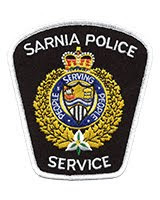 Two Sarnia officers charged under the Police Services Act could face internal discipline following a hearing next month. Const. Steven Wyville and Patrick Nahmabin are each charged with two counts of discreditable conduct in relation to a break and enter in the city last year. Both officers pleaded guilty and received discharges in court last week. The hearing will take place over two days on Oct. 22 and 23 at police headquarters. The officers were charged last year after being unlawfully in a home in which they were looking for Nahmabin’s stolen badge. The discharges left both veteran officers without criminal records. In the meantime, they remain suspended with pay. The officers could face a range of penalties from suspension, demotion in rank and pay, and even dismissal.